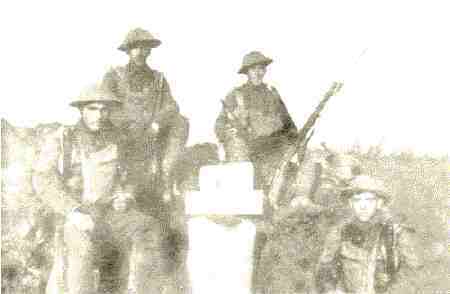 14th Royal Irish Rifles, B.E.F. 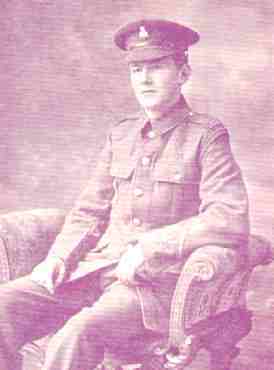 Signaller W. McCormack 1894-1969 of the 14th Royal Irish Rifles, B.E.F. was from "Holmstead," Marlboro Park North, Belfast. I am his grandson Paul Crawford from Ontario, Canada. My grandfather's diary goes from 12/9/1914 enlisting day to 28/2/1919 day demobed. The original diary was typed out in the mid-70's by relatives and given to every child and grandchild. 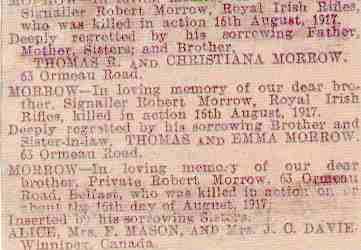 Robert Morrow mentioned in the section on the Ypres Sector was my grandfather's brother-in-law. The only mention of the war to me was where he got the scars on the back of his head and neck. The only other evidence ( to my knowledge, I was 5 when he died) was that could not sleep in his house in the warm weather but had to sleep in his hammock outside. Just a few lines in the assembly trenches at Thiepval. It is now 5 am and we expect to attack about 6. We left Forceville last night about 10 pm and arrived here about 1:15 am. Spending the night in the trenches during a terrific bombardment. Fritz replied now and then, but appeared to be saving his ammunition.I cannot describe my feelings at getting up and over. But, to me it is like going in for an important examination, and all ones senses are devoted to doing his very best, "sink or swim". But I'll close now as this is only a few lines before going into action, and I know I'll have good news to write shortly. We waited patiently for the word to go over about 6 am. And at 6:20 sharp we had what's known as a "hurricane bombardment". It was terrible the roar and screeching and this lasted until 7:30 am. When we got the word to mount. This next part (same day, and place) goes with the sent picture. These dugouts were the ones they were advancing toward. These dug-outs are the finest I ever saw. They possess a large stairway and are very roomy, besides being fully 30 feet below the ground. They are far better than any of ours, and any I was in were well stocked with wine, cigars and bread.Besides being well regulated and covered with pictures.We dug a firing step here, and after this I proceed to the fourth line. It was here the heaviest fighting took place, but we bombed them out in the end. ...left at 1:15 a.m. and proceeded as best we could along the road which was full of shell holes. Fritz started shelling the road and caught a few more of our chaps. Pretty exciting journey! Finally arriving just behind our present line about 1:50 a.m. Straff still raging on our right and left but pretty slack on our front. 4:45 a.m. we were to attack at but at 4:30 a.m. Fritz put up a fearful barrage both in front and behind us and thinned our ranks something awful. Mr Woods our scout officer got an awful cutting up whilst speaking to my party. And a runner just on my right named Harris got a piece of shrapnel right through his heart. We did all we could for him but he didn't live very long. Fragments were flying all roads and outof my party of eight (advanced H.Q.) 5 were hit and made there way down to the dressing stn. Bob Morrow was unable to do so as he got a bad wound in the brain which rendered him unconcious. I bandaged him up and gave him a drink of cold tea. He got delirious and tore his bandage off so I put another one on. And later he got a S.B. to put a decent one on. But he died shortly afterwards and I felt miserable as I knew him extra well. Besides he was on my party and seeing as one was already missing I was left alone as far as my stn. was concerned. Fortunately Sandy and a young chap called. Craig were beside me so I attached myself to them. 4:45 a.m. [?? seems to be an error] All our machine guns and artillery opened up and created a fearful din. But Fritz barrage was far heavier than ours and his machine guns also, as he had weakened our artillery considerably for weeks past. Our chaps mounted A1 but were mown down like hay. Very few reached the ridge and when Fritz saw this he rallied again and attacked our rear. Our flanks didn't get as far as we did and we had to fight our way back. I was still in front line as I was to over after second wave with my party, but what could I do? Shortly afterwards all hands rallied a little in advance of our own front line and continued, to hold same Fritz counter-attacked time, after time but was unsuccesful.But he continuned to shell heavily and suceeded in blowing up quite a few dugouts full of wounded. Walter Gulston was in a dug-out that Fritz got a direct hit on but i am thankful to say he was one of the very few that escaped only with a bad shaking. After that Sandy, Walter, Craig, and I stuck together for the rest of the day. It was cruel to see the dead and wounded lying around and Fritz's barrage got so heavy at times even the wounded couldn't get away. A dressing stn. (an old wrecked house) just behind us was full to overflowing and flying a very large Red Cross. Fritz turned his guns on this and it was painful to see his direct hits. Our own dressing stn. fared no better and our doctor and medical cpl. were both wounded. Stretcher-bearers were very scarce and had an awful busy time of it. Things slackened off a little in the afternoon so Sandy and I salvaged as much signalling kit as we could get our hands on and piled it away only three yds from where we were. About half an hour afterwards three shells lit right on top of it and that was the last we seen of our kit 'pigeons and all'. Besides another signaller was badly wounded after escaping all day. we were to hold on for at least 24 hours but when the different Staff Capts went around to see the strength of each Bde we were not long in hearing that we would have to be relieved that night. It was good news; but would night never come? Every hour was like a week and Fritz was getting busy again with a new form of Gas shell (Mustard Gas) and heavies. Shortly after dark the Adjt. told that was left of the sigs. (7 out of 22) that we could clear out into reserve as it got quieter, as the road down and the surrounding fields were being heavily shelled. So when Fritz started in another direction we simply tore down that road shell holes and all. Twice I went up to the waist but never even stopped as I had seen too many poor chaps caught on the same road. And we were just out of his usual shelling place (barrage) when he started again. There were a few sighs of reief you may be sure. But even then we were not safe as Fritz believes in shelling pretty far back. So we tore on down to Liverpool Trench. Walter and I discovered an old broken down shlter and we stretched ourselves as best we could and were soon fast asleep, as we were clean done.